I received Plus Rigina’s Green Tea Milk Spread as a gift earlier this year because, as rumour has it, I really like tea and people tend to think I want to try tea things (spoiler: the rumour is true). 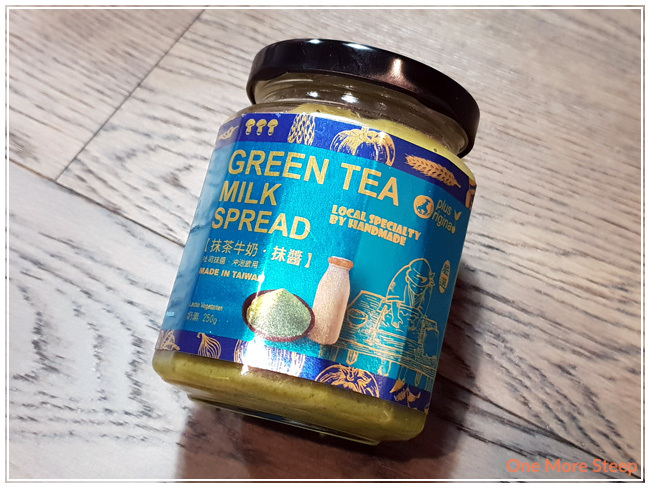 Green Tea Milk Spread comes in a glass jar, it’s an imported product from Taiwan. I’ve never seen it in a store in the Metropolitan Vancouver area, and a quick Google search turned up nothing for the brand or product so I’m not entirely sure where you can find it (sorry?). But it’s tea related, and I’m a fan of potential bagel spreads, so I did have to give it a try. The ingredients in Green Tea Milk Spread are full cream milk powder, sunflower oil, sugar, water, green tea powder, and whey protein. After opening and popping the seal on the lid, I found that the spread has a thick consistency. It’s a bit softer than commercially produced peanut butter, perhaps it’s similar to Nutella (chocolate and hazelnut spread, if you’re not familiar). 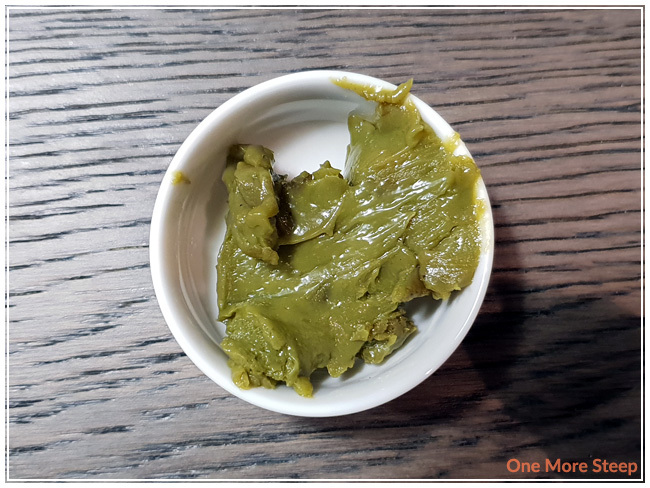 The aroma of the Green Tea Milk Spread is sweet, and has a very mild green tea aroma. This product is shelf-stable prior to opening, and must be refrigerated after opening. After toasting a bagel, I put the Green Tea Milk Spread on it. I’m not generally one for thick layers of smear on my bagels (aside from cream cheese, I do love cream cheese!) and this product doesn’t seem to lend itself well to being spread thickly on anything (again, it reminds me of Nutella). The mild aroma of green tea is pleasant. 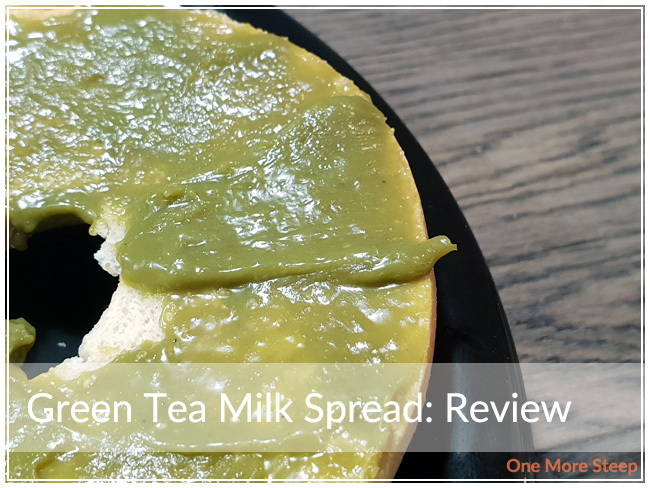 The taste of the Green Tea Milk Spread is primarily green tea and condensed milk, although it’s not as sweet as condensed milk. I think it could have a stronger dairy flavour to it, and maybe a bit more sweetness (but it reminds me so much condensed milk, so I feel like it should be sweeter). Despite sugar showing up on the ingredients list prior to green tea powder, each teaspoon (1og) contains 3g of sugar, which is interesting (I’m sure if it was condensed milk, it’d be like 9g of sugar per 10g of product…). I liked Plus Rigina’s Green Tea Milk Spread. I think the flavour is pleasant and makes for a nice bagel spread, so it might also pair well with tea biscuits. For me, I feel like it could be sweeter, but I do have a bit of a sweet tooth. If you’re not as in love with sugar and sweets as I am, you might be really happy with the level of sweetness in the Green Tea Milk Spread. Either way, it’s a nice bagel spread and it does become more liquid-y when heated, so it might be a nice drizzle over some vanilla ice cream as well (because, yum).